With the final week of the transfer window upon us, Arsenal still haven’t bought a defensive midfielder. (Drink.) And if that doesn’t change for the first time in what feels like a century running, it’ll be because Arsene Wenger has decided to ride with Francis Coquelin. Let’s just get this out of the way: Coquelin is not a great midfielder, and he never will be. His game’s just not close to complete enough to ever be described as such. Yet, as of last May, Wenger was saying, “If we had bought Coquelin at Christmas for £40 million, everyone would say ‘what a signing.’” At that point, after being recalled from a loan with Charlton Athletic and playing a central role in Arsenal’s shock 2-0 victory away to Manchester City in January, he’d become a fixture in the Arsenal starting 11. But, so far this season, he’s been an attacking liability in a loss to West Ham, a walking red card in a win at Crystal Palace, and, after some nice moments in the first half of yesterday’s scoreless draw against Liverpool, an unnecessary spare part. So why the wild swing in perceived performance? In short, it’s because he’s a central midfielder. Attackers score, defenders keep others from scoring, and central midfielders are supposed to aid both of those things. At once, they’re positioned in the part of the field where the ball spends most of the time, but they’re almost always a step removed from it ending up in the goal. Even the best midfielders in the world only look like they’re playing well when they’re aided by the tactics and the players around them. As Coquelin isn’t one of the world’s best, he’s especially at the whims of the circumstances he’s asked to perform within. When the Frenchman looks like he’s struggling, it’s often not just a question of why, but rather why is he being asked to do these things in the first place? Coquelin was catapulted into relative stardom because of how well his skill set lined up with how Arsenal wanted to play when they went into Manchester. Wenger opted to have his side sit deeper, absorb pressure, and then counterattack. This is a relatively common approach for teams visiting the Etihad, but not for the Gunners. “Sit and counter” had been noticeably absent from Wenger’s playbook in the years leading up to the match. And at the Etihad in the previous season, they were obliterated, 6-3. A decision to back away from Arsenal’s more traditional free-flowing attack wasn’t a capitulation; it was a damn near revelation. 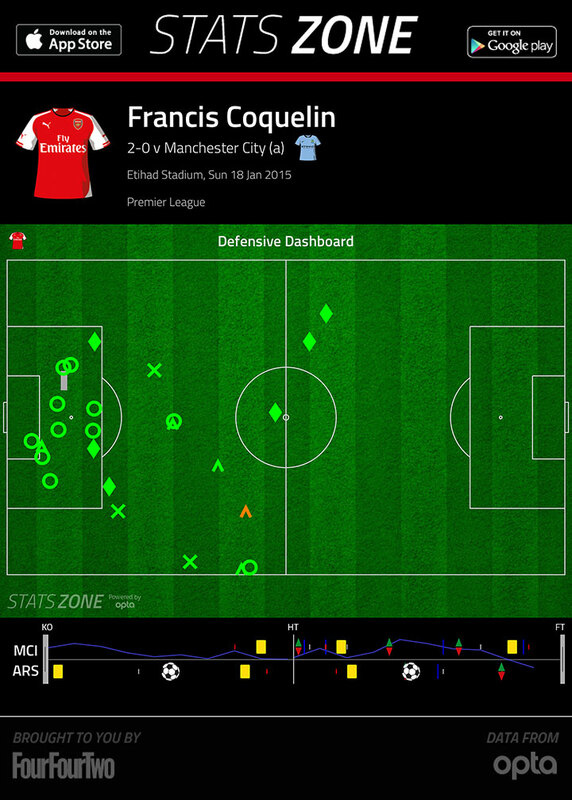 To understand how well the tactical choice fit Coquelin, just take a look at all of his defensive actions: Tackles, interceptions, and challenges galore. He found all of those pockets of space that Manchester City maestro David Silva likes to pop up in, and he got there first. Now, look at the context for all of those defensive actions. Coquelin rarely found himself isolated during this match. He’s free to try to win the ball, because other defenders are there to provide support should he not. This is not a criticism. This is good defense; it’s Coquelin doing his job within a setting. But let’s also remember that Manchester City were without Yaya Touré, whose blend of exquisite skill and powerful running from the middle of midfield plays an important role in their attack being able to blow compact defenses apart. Again, not a criticism, but it drives home the point: The match in Manchester provided a confluence of circumstances that allowed Coquelin to shine. The biggest problem with the Frenchman’s performance, then, wasn’t that he didn’t play that well. It was that he’d almost never get the chance to play the same way again. To understand what Coquelin didn’t have to do against City, take a look at Mathieu Flamini’s moment of infamy in the reverse fixture against Manchester City last season — a 2-2 home draw in September. To oversimplify things just a little bit, there are two kind of systems in which defensive midfielders function: There’s the tight and compact defense, in which the midfielder has to eventually take the ball away from an attack that has already been contained. And then there’s the defense that provides space, in which he’s the one who has to contain that attack in the first place. The best in the world at defending in space is Barcelona’s Sergio Busquets. His job description is essentially “Kill any counterattack before it gains steam.” Sometimes that’s through obvious actions like a last-ditch tackle or a lunging interception, but just as often, it’s being in the right place to prevent dangerous passes or dribbles from even being attempted. You know all those quiet moments in a game when a midfielder wins the ball, looks up, and then elects to pass it backward? That’s usually down to a defensive midfielder properly defending in space. For teams that want to dominate possession deep in their opponents’ territory, having a defensive midfielder who can function in the Busquets role is crucial. It’s a big part of why Manchester City struggled so mightily last year when Fernandinho was injured, and it’s no coincidence they’ve looked so sharp with him back in the team. It’s also the reason that Manchester United went out and got Morgan Schneiderlin and Bastian Schweinsteiger over the summer. You don’t have to play that way to be a great team, as Jose Mourinho and Diego Simeone can attest, but with lesser teams more than willing to cede territory (like Arsenal did against City), it’s a readily available path to success for top clubs. But to do it the right way, having a midfielder with the range and foresight to single-handedly patrol large swaths of the midfield is a must. Otherwise, teams will sit back, counterattack you to shreds, and you’ll end up losing 3-1 at home to Monaco. Even for someone as almighty as Busquets, the size of the fire you have to put out still depends on your teammates. Just look at Nemanja Matic. Last year, playing in Chelsea’s compact system, he looked absolutely dominant. This year, he’s on a team that have given up seven goals in three games and seen their opponents find plenty of success down the middle of the field. In Chelsea’s opener against Swansea, Jonjo Shelvey had a fantastic game marauding through the center of the field — the exact areas where you’d expect Matic to be sitting. 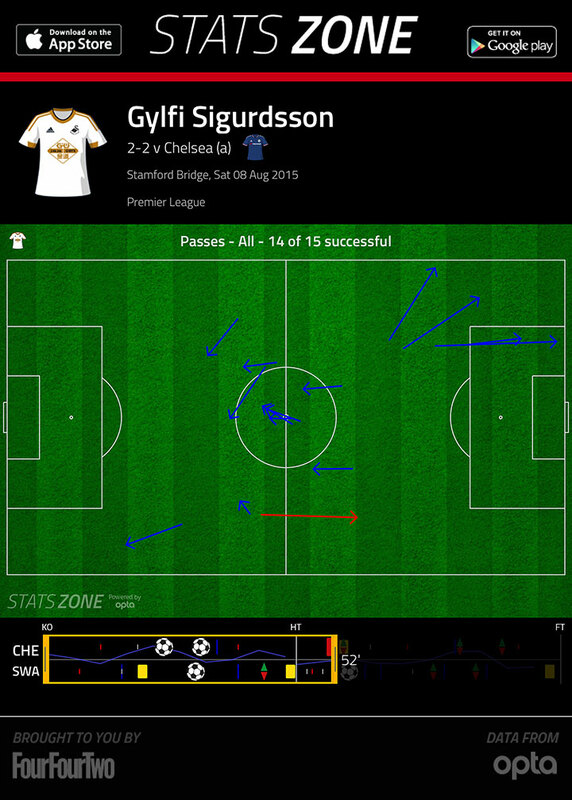 But in that match, much of Matic’s job was to shut down Gylfi Sigurdsson, Swansea’s attacking midfielder and primary playmaker. Matic followed Sigurdsson across the field and kept him quiet, but the rest of the Chelsea defense either didn’t get the strategy memo or simply were not good enough, as Shelvey and his midfield partner Ki (before he got hurt) charged into the center and created havoc. Other times, like in Sunday’s 3-2 win over West Bromwich Albion, it’s easy to place the blame. First, Matic gave away an early penalty in exactly the kind of situation where he’s supposed to thrive. The defense was compact, the threat was contained, and it was up to Matic to decide to win the ball back … oops. Then, later in the first half, Matic got caught in no-man’s-land. As a ball gets crossed into the box, he drifts back toward the defensive line to help with a man who is already well covered. That leaves James Morrison wide open to finish off Solomon Rondon’s ridiculous bicycle-kick pass. Figuring out Matic’s performance is typically straightforward. He’s usually playing the role he’s best suited for, so it becomes a question of how well he’s doing those things: shutting down attacks up the middle, winning tackles, making interceptions. But sometimes, like against Swansea and City, the typical grading template still doesn’t suffice. If Matic usually thrives or fails within a system, then Coquelin thrives or fails because of a system. His performance on the road against Crystal Palace two weekends ago is a perfect example. Arsenal won 2-1 in a typical Arsenal performance. They controlled the ball, flowed forward through a porous Palace midfield, and tortured their opponents with a seemingly never-ending barrage of shots.2 However, Arsenal’s dominance in possession left plenty of space for Coquelin to defend, which he did … by fouling everybody in sight. He committed four fouls in just over 30 minutes, and after picking up a yellow card early on, he narrowly escaped a second caution two more times before Wenger was forced to remove him for fear of going down to 10 men. This is the kind of defending in space that Arsenal’s defensive midfielders have to do regularly, and it’s completely different from what Coquelin excelled at to win his place in the team. Now, if he could provide an attacking element, his troubles in space wouldn’t be as much of an issue, but, quite simply: He can’t. Against West Ham, he was an active impediment to Arsenal creating chances. And against Liverpool yesterday, he put out a number of fires in the first half, but then he was subbed off as the game remained tied and Arsenal needed a goal. There’s a reason Coquelin was loaned out to a Championship club as recently as last season: He’s a limited defensive midfielder who can be effective in the right situation, but it’s rare that Arsenal ever play a team that’ll compel Wenger to instruct his team to sit back and try to counter. That Coquelin has come to embody something more has nothing to do with him and everything to do with the systemic factors that make the position hard to judge and even harder to play. He is just the latest square peg trying to fill an oversize round hole. But after rotating through peg after peg after peg, Arsene Wenger and Arsenal don’t seem any closer to realizing that maybe the hole is the problem. In reality, it was 20 shots.